The global oil storage market is rather competitive among the top five players, who jointly held a share of more than 67.0% in 2014. These five players are Royal Vopak N.V., Buckeye Partners L.P., Oiltanking GmbH, Kinder Morgan Inc., and NuStar Energy L.P. The Transparency Market Research report suggests that this market is extremely capital driven and hence, the entrance of new players is highly unlikely during the forecast period of 2016–2024. 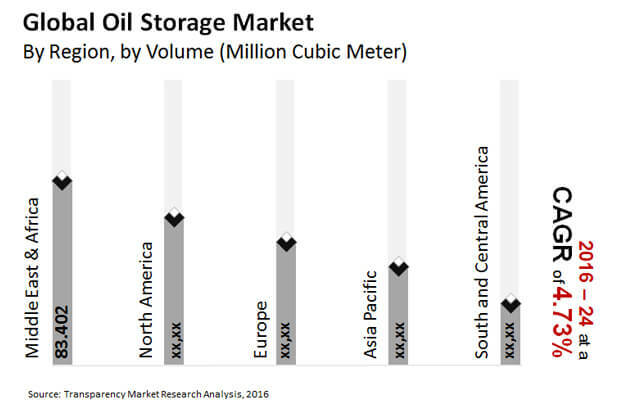 Rising at a healthy CAGR of 4.73% by volume during the forecast period, the global market for oil storage is estimated to reach 2,027 mn cubic meters by 2024, up from 1,337 mn cubic meters in 2014. The report also finds that several companies are indulging in strategic alliances, mergers, acquisitions, partnerships, and joint ventures to maintain their hold over the global market for oil storage. Via these strategies, these key players in the market are able to raise funds, which they use to develop new pipelines, extend their storage facilities, and expand their terminal networks. For instance, Kinder Morgan acquired Hiland Partners in 2015 in order to enhance its storage and terminal infrastructure in North America. The global oil storage market is segmented on the basis of type of reserve and geography. By type of reserve, the market is segmented into commercial petroleum and strategic petroleum reserves. In 2015, the segment of strategic petroleum reserves accounted for a massive 79.21% of the market. This was a result of substantial investment from several governments for the expansion of oil reserves. On the other hand, the segment of commercial petroleum reserves is expected to expand at a stronger CAGR of 7.8% during the forecast period 2016–2024. This increase in demand is attributed to fluctuating oil prices because commercial petroleum reserves help control the prices and plan for the future. Geographically, the Middle East and Africa serves the most prominent demand in the global market for oil storage. Countries such as UAE, Iran, Saudi Arabia, Oman, Qatar, and Nigeria contribute to most of the demand in the MEA oil storage market. Extensive oil production and declining oil prices are two factors driving these regional markets. The supply of crude oil has exceeded the demand in recent years and, as a result, the demand for oil storage facilities has increased globally. Concurrently, the leading players in the market have increased their focus on expanding storage capacity, particularly their refineries in Asia Pacific and Europe. Moreover, the quality of road travel has improved drastically in the past decade, which has aided the transportation of finished petroleum products and in turn driven the demand for oil storage. For example, CLH Group raised over US$200 mn in 2015 to develop its integrated network, including several kilometers of storage facilities. Conversely, the high cost of initial investments and time-consuming approval processes are some of the factors that may hinder the growth of the market. According to the author of the report, “The investment in oil storage facilities must be done with long-term goals to ensure higher returns.” The author also picks out Asia Pacific as the most lucrative market for players. Countries such as China, Singapore, Japan, and South Korea are among the leading markets for oil storage in this region in terms of volume, driven by increased investments in petroleum reserves.